All new for 2019! 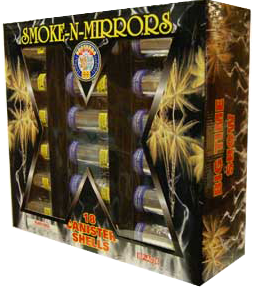 Each box contains six (6) sixty-gram maximum load artillery shells that will rock your world and your celebration. Effects include:Silver Crackling w/Green Strobe; Multi-Color Dahlia & Silver Strobe; Brocade Crown w/Multi-Color Strobes; Brocade Crown Willow w/Silver Strobe; Multi-Color Willow & Crackling Stars; Gold Glitter Willow w/Blue & Green Strobes. This is one big box of BOOM! 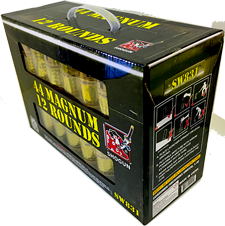 24 pieces of fully loaded 60gram shells plus bonus two 2" single shot #200 Shells. 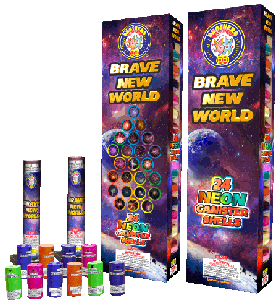 24 Shots of neon excitment to light up your display, twenty-four different effects with brilliant neon colors, all new in 60 gram reloaders. 48 colorful shells of 20 assorted effects: 16 Single break spheres, 16 Single break cylinder shells, 8 Double break shells, 8 Triple break shells, total number of breaks 72. 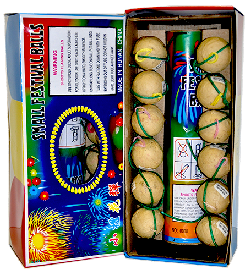 24 pieces fully loaded shells plus a bonus of two 140 shot cyber candles. You can really mix it up with this pack! 80 Color shells of 29 different effects shells. 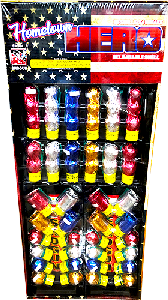 Dixie Dynamite is the new 60 gram artillery shell from Atomic Fireworks, 24 ear splitting , sky lighting, assorted shells. For the maximum in sound and color, this is the shell you want. For the serious pyro fan! 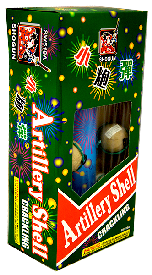 A 60 gram shell with 24 different and specular effects. This is one of the largest artillery shell on the market. 8 Double Break, 6 Triple Break, 6 Quad Break Shells gives you 58 total breaks of night time mayhem! This one is for the Big Boys (and Girls!) a complete night time display! 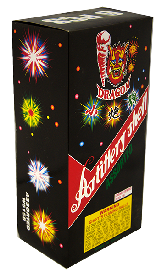 24 canisters of 60mg high explosive power that travels approximately 400 feet into the heavens to give you a night sky full of peony, chrysanthemum, dahlia, palm tree, willow, and brocade crown bursts. 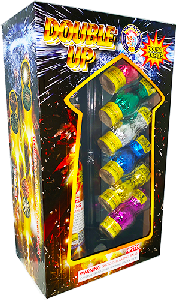 These wondrous 5 break shells feature multicolored stars, silver and green glitter, and crackling stars. 6 boxes with 6 shells per box. 120 shots, 192 breaks Contains single, double and triple break shells! There is no illusion with Smoke and Mirrors. Each box has three kits of six canister shells which are manufactured using newly developed techniques. You will see golden willows, cracking flowers, time delayed crackling, colorful bouquets, colored stars, flying fish, glitter, and multicolored scrambling comets. 18 big breaks. 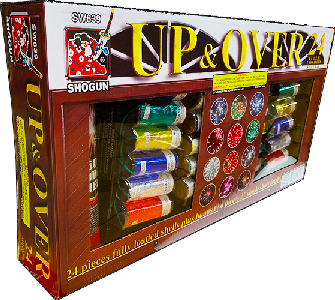 Six super triple break shells with assorted effects. 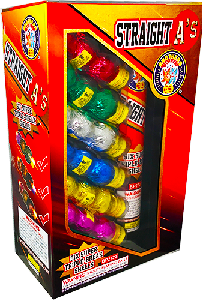 Six super double-break shells with assorted effects. 6 Different effects shell with heavy loaded gold and silver tiger tail effect. Don't it make you want to smile! 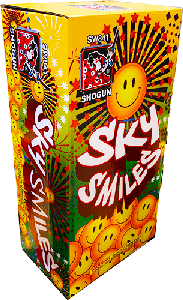 6 shots of 3 different color shells that break into a big smiley face, all new! 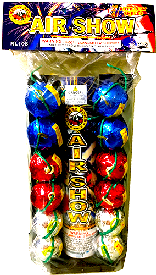 Twelve 1.75" assorted shells that give a big time break for a small time price, a Cherry Bomb exclusive item. 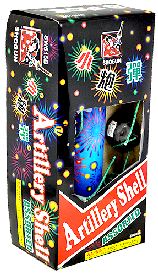 Classic black box artillery shells - the original! 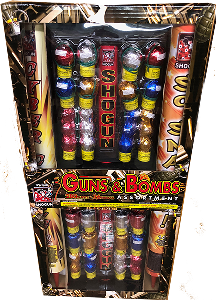 Shogun's take on the classic spherical assorted shell, 6-1.5" assorted shells. 6 color shells of 3 different effects shell. Shell size: 3/4” diameter. Six 1.5" Shells that has a crackling tail as it rises to it's apex and then bursts into a large chrysanthemum display. 12 color shells of 6 different effects shell. Shell size: 3/4” diameter. 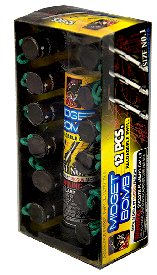 6 Shots of 1.5" shells, A six shot version of the Cherry Bomb 12 shot, a great value. This is it! 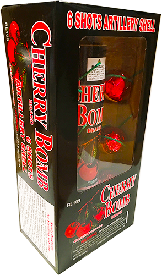 The original Cherry Bomb 12 shot artillery shell, the best selling 12 shot box on the market today. Each box contains 2 each of peony, chrysanthemum, palm tree, dahlia, willow, and brocade. Like our motto says "The Best". The 12-shells catch your attention with hard breaks and keep you guessing when the initial color burst changes into another color right before your eyes. 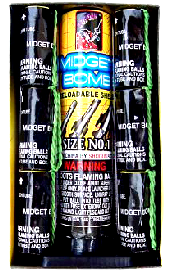 Classic artillery shell action with a new formulation. One-inch canisters have all the bang of the originals, with smaller packaging for a higher value. 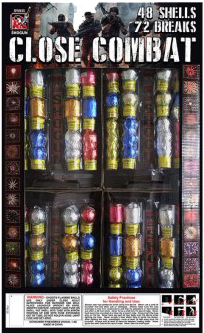 1.5" Shells, 12 to a box the classic original Festival Ball, a great value!